Concrete slabs for interior and exterior. Dadas as características dos agregados de origem de pedra natural e a sua reprodução fotográfica, poderão existir ligeiras variações de granulometria e de tonalidade. Interlock - Concrete slabs for exterior. Given the characteristics of aggregates and their photographic reproduction, there may be slight variations in particle size and tone. Concrete slabs for interior and exterior. Given the characteristics of aggregates and their photographic reproduction, there may be slight variations in particle size and tone. ... pool beaches which are resistant to external agents and also designed with a special care. Inspired by natural elements, the concrete tiles imitate the stone, wood or mud and they dont need further treatment. The concrete paver is commonly used for patios, pool decks, walkways and other exterior pavements. Made from cement, gravel, sand and water, it can be of many different shapes and sizes. Price is a function of thickness. 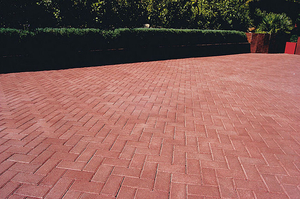 Such pavers can be colored by the addition of pigment when the components are mixed or by the post-fabrication application of one or two surface layers. Those thicker than eight centimeters are suitable for heavy vehicular traffic. Models between six and eight centimeters can handle light vehicular traffic. Thinner versions are suitable for pedestrian use only.